Hey friends, this my first tutorial and just turned 16yr old two months ago. In this project I will show how to make 5 channel SMS based Home Automation system using 1sheeld. Instead of using electromagnetic relays I've built my own cheap SSRs using triacs with an indication LED. A great thanks goes to Amr Saleh and the whole team of 1sheeld. If you know about the Arduino and its shields like GSM and WIFI, and also buying each of them for use is expensive. To replace them all with just one, the Egyptian inventors made a wonderful single shield which connects to your android smartphone via Bluetooth and uses all the sensors and connectivity of it. You can also use more than one shield at a time like GSM, WIFI, Accelerometer, Gyroscope etc. 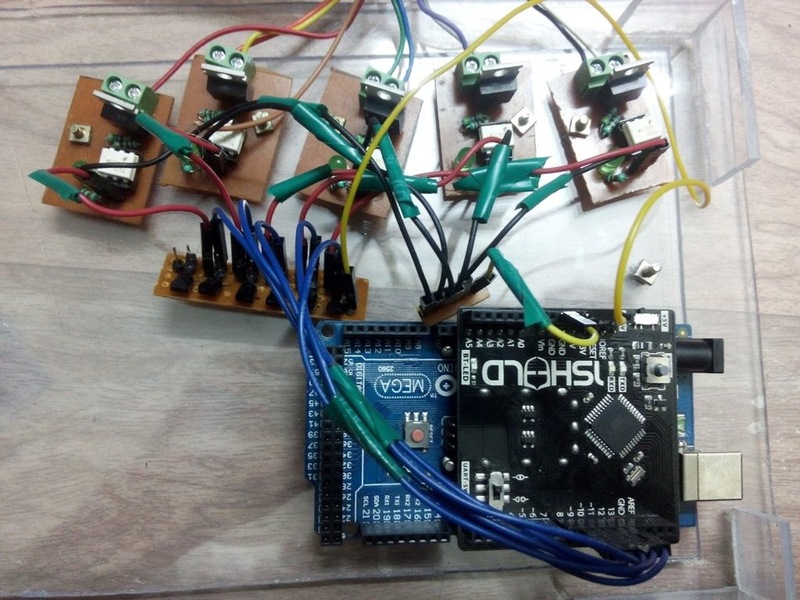 You need to place your 1sheeld correctly, confusion can arise while using with Arduino Mega. And then extract it to the location in libraries of arduino. Open arduino IDE then copy and paste this code. The code is based on 10 simple analogWrite commands. I'm not a good programmer at all, I'm still in 11th grade and have to concentrate on my academics/school so I cant spend much time learning coding, there may be lot of mistakes in the program and I will highly appreciate the suggestions for improvement. You can view or download the code from here. Open arduino IDE then copy, paste this code and then upload. Download it from Playstore, open it, turn the Bluetooth on, connect to the 1sheeld and then select the Orientation Shield. I've made a driver circuit using the 2n2222 NPN transistors. For relays I will suggest to use the homemade one and the circuit is being made in Express PCB and the link is here. And also you need to tin the PCB and I used to tin by my own new method using soldering Iron. NOTE: IF YOU ARE NOT EXPERIENCED TO WORK WITH HIGH VOLTAGE THEN YOU SHOULD USE LEDs IN PLACE OF ANY HIGH VOLTAGE APPLIANCE. AND I'M NOT RESPONSIBLE IF YOU HARM YOURSELF OR YOUR PROPERTY, USE PROPER PRECAUTIONS AND UNPLUG EVERYTHING EVEN BEFORE GOING NEAR TO IT. Just fix everything and make every connection. I know that there may be a lot of suggestions for improvement of this project jumping in your mind, so please use the comment section and let me and others know. As I told you this is my first project with 1sheeld so, sorry for all the mistakes that I made( I have no guidance other than internet) and I hope that you liked it. 5 pins which are used here pin: 13,12,11,10 and 9. I'm from India and love making projects on electronics and especially with Arduino.